Vision, still in his suit and tie from work, stood surrounded by the shattered windows and splintered wooden walls of the home he tried to build for the android family he created. When he was born, he was meant to be a weapon, a force of destruction against the Avengers. He tried to be something else and pursue happiness. Stepping over broken glass and scorched floorboards, he must have realized it wasn’t working. The dream of the picket fence and two-car garage might have been nothing but an illusion that he was foolish to believe. In that moment, Vision had a choice. He could accept what the world was trying to tell him: that his dream and his reality are irreconcilable. Or, he could choose to believe the dream and press on, regardless of how impossible it is, regardless of who or what tries to oppose it. The conflict of trying to reconcile two opposing ideas beats at the heart of The Vision, a great comic book written by Tom King and drawn by Gabriel Hernandez Walta. 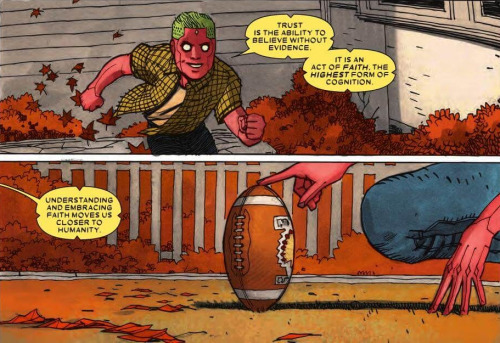 Vision is an invention of the villainous Ultron; he’s also a hero. 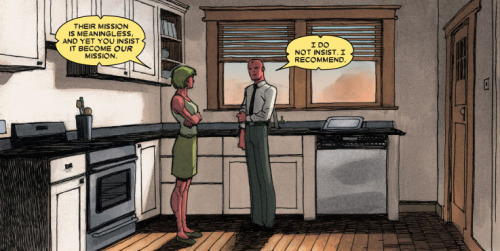 Virginia, his wife, was built as a copy of Vision’s first love, Wanda; she’s also meant to be her own person. They and their children are unmistakably robotic in both appearance and behavior; they yearn for acceptance as normal people. Together, they build a domestic life in the suburbs, but in a world where super-villains could come crashing through the walls at any moment. When one does, these conflicts are tested, and that friction fuels a story that would fit comfortably on a shelf beside stories like The Great Gatsby or Mad Men that interrogate The American Dream; whether its ideals of individual freedom, social mobility, and rewarded work are true and attainable by everyone. And can those ideals ever live up to what we want them to be? An early chapter of The Vision emphasizes that the hero has saved the world more than a few dozen times. He’s put in the work. He’s made a considerable effort to contribute to society. He’s done his job. He wanted his reward: a loving family, a house in the suburbs, the picket fence. But in a moment, it all starts slipping through his fingers. In this way, The Vision reads more like Fitzgerald’s Jazz Age classic than a traditional Avengers comic concerned with superheroic spectacle (but don’t worry, there’s that, too). Jay Gatsby lives anew in Vision, who invents and buys into a lie to attain a dream, which may or may not be real. Vision suggests early in the story that to give truth to something that isn’t real is the core of being human. But he doesn’t believe the cynicism of his own remark. He wants his hopes to be real, or else he struggles in vain. In the end, what he really wants is the power of faith: to believe in something when your reality tries to tell you otherwise. When he’s standing in a house that’s literally crumbling under the weight of his pursuit of a normal life, he wants to believe he can have it all. He wants to reconcile two opposing ideas. Consider two more juxtaposing ideas: a scene heavy with thematic statement and symbolism drawing on decades of comics history, and the most mundane of Saturday afternoon activities, reconciled into a single page. (Such is the artistry of The Vision.) Vin and Viv, the Vision’s children, are playing football in the backyard. Viv crouches by the ball, holding it in place, while Vin takes a running start to kick it. They’ve done this seven times before, and each time, Vin has failed to launch the pigskin into the air–a predicament painfully familiar to comic-strip legend Charlie Brown. But in the face of failure, in the absence of supportive data that he can succeed, Vin tries again, boldly.